Jack Potter studied at The California Art Center of Design and graduated in 1949. At the time there were many students who had just returned from military duty and going to school under the G.I. bill. He told me that he benefited from being around students who had such a strong work ethic. In addition to a commercial art education Jack secured a scholarship to the Jepsen School where he studied under the fine artist Rico Lebrun. Shortly after graduation he went to New York to make the rounds. The first agent that reviewed his portfolio wanted to represent him and the rest is history. His career took off! He started getting work from all of the major Women’s magazines and later for big advertising campaigns such as Coca-Cola and Fuller Fabrics. He never liked talking about his illustration career while I knew him. I could see that it bothered him when students asked about it. Looking back, I think a lot of it had to do with the fact that he had quit the business so long ago (in the 1960’s) and was asked about it all the time. I was curious to know more about his work and illustration career. The first piece I found was a Coca-Cola Paris ad in an old Society of Illustrators Annual in the SVA library. I knew I needed to keep digging and see more. I generally tried to respect his desire to not discuss his illustration career but occasionally he would volunteer things. One night at his apartment, with a grin on his face, he took a blue portfolio from a box and handed it to me. Smile stretching ear to ear he said, “I was a star!” To my surprise it was tear sheets of his illustration work. We talked for a bit about the business back then and at one point I could tell he was a bit down. 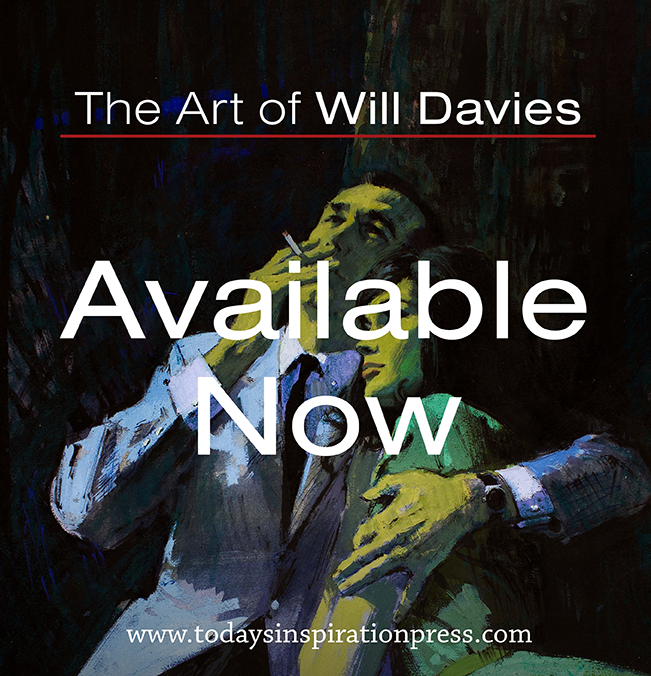 He said, “I know how difficult it is today for artists like yourself.” He knew that the business had changed and that he had worked in a golden era of illustration. I wish I could see the drawing that Jack is holding in the first picture. The small bit that I can see looks great. Wow, thanks for posting these. The color and composition is extraordinary. Having limited art training I'm always curious about certain effects. I'm wondering if sections of the illustration were masked off and if a pallet knife was used in addition to brushes? I'm not sure anyone teaches this stuff anymore. Stay tuned. In the next installment (tomorrow) I talk a bit about his process. I'm really looking forward to the next installment. I think it's so terrific that you're sharing these stories about Jack. 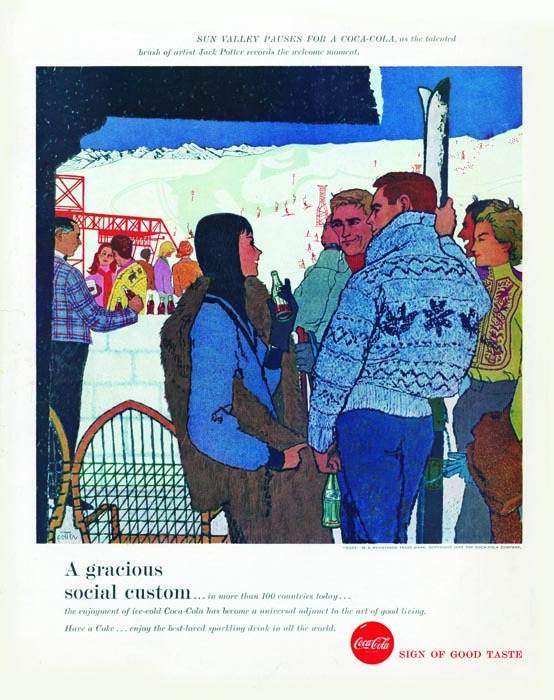 The Coca Cola ads and the Fuller Fabric ads were done around 1959, while I was a fledging illustration student. 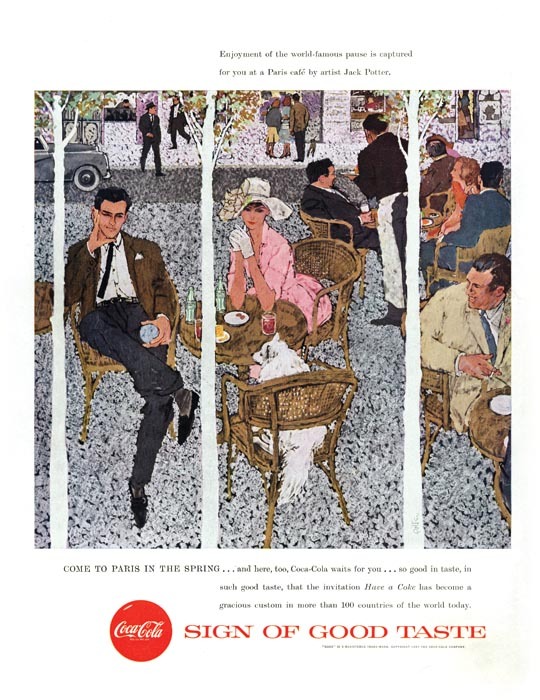 I remember how excited we were when we saw our first Jack Potter illo, which was the Paris cafe scene for Coca Cola. "WOW! This guy is really great.. look at that incredible composition from above, looking through the tree trunks". The Coca Cola and Fuller Fabric series really blew us away. It looked so different.. very stylized, fashion oriented and jewel like color in bold decorative combinations.. very elegant, sophisticated with charming little touches. His strong design was so striking, and his technique was a real inspiration for us eager illustration students. 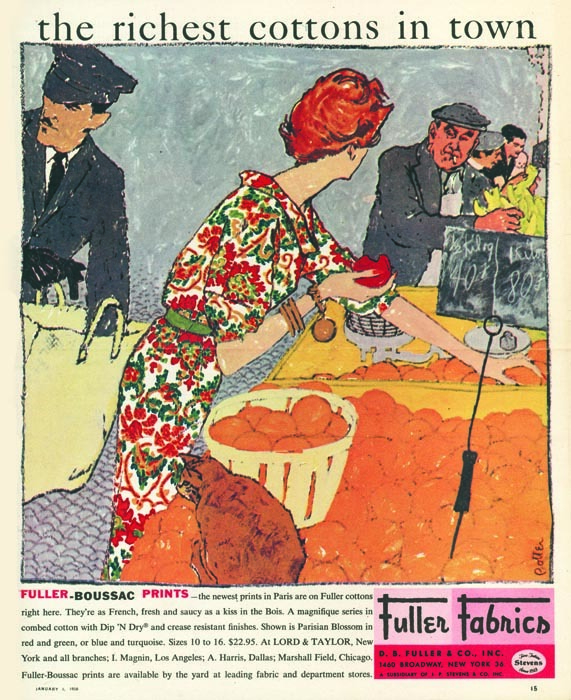 incidentally, Th Fuller Fabric ad of the woman picking out fruit at the market, won an award of excellence at the first N.Y. Society of Illustrator's Show in 59', and the Paris Coca Cola ad and another Fuller Fabric ad of a cafe scene, were accepted into that show, as well. 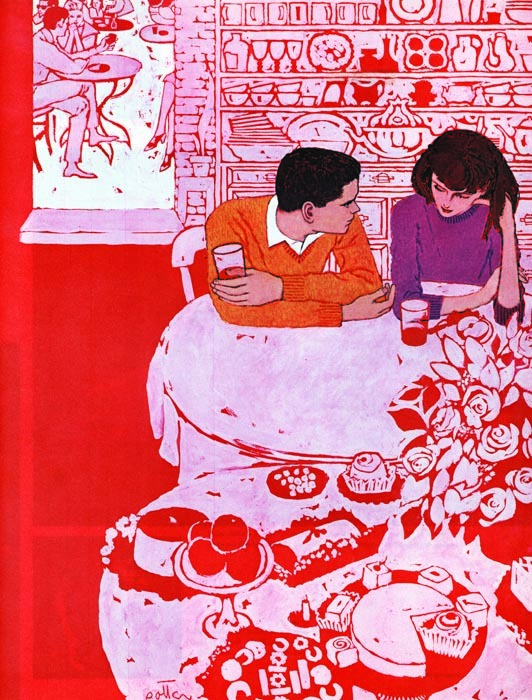 IMO, Potter was one of the great mid century illustrators, if only for a short period. 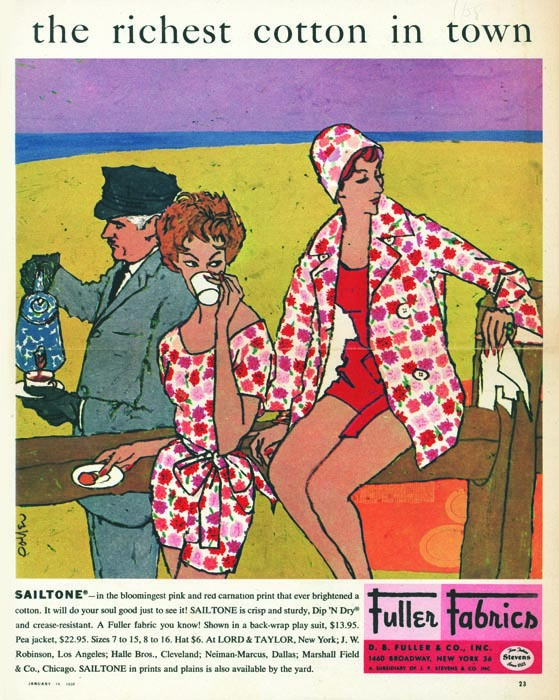 You don't happen to a sample of the Fuller Fabrics cafe ad do you? How many did he do? I only know of four. Two that are posted above, another that Leif put in a previous post (it's on his flickr page) and one at a carousel. I love that campaign. The Potter era is interesting on several levels. 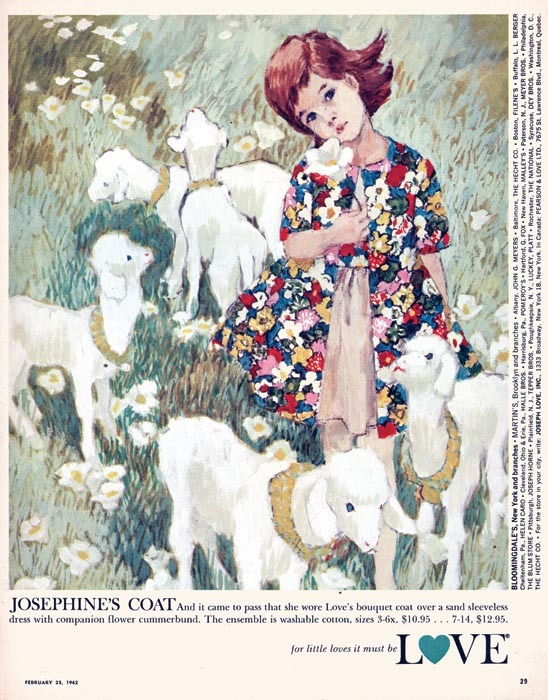 As Tom said, his first ads were startling....almost the effect Bernie Fuchs had when he suddenly arrived on the scene. From my viewpoint, as an older 'meat/peas/& potatoes' and 'sock it to 'em' type, I grudgingly respected Potter and the arty new guys. But I had strong doubts about the reader reaction to many of those. Then, experience told me the average reader hardly knew or cared whether it was art or photography. On another level, it's interesting how all of our careers, regardless of styles, were 'victims' of the great print media change and loss in the 70's and then on. I didn't know about Potter's dynamic teaching career....and his advice on future careers in illustration. In the mid or late 60's I was asked by a local community college to teach an illustration class. I asked how many students would probably attend....and the young lady said 'a class of about 100' I was astounded....and inquired if they had a large enough space for art desks or easels for that many students. She answered, 'Oh no....it would be purely a lecture class'! I declined of course....and pointed out that maybe a handfull of illustrators in S.F. made a living in the field, even in the best of times. Daniel, I just have a B/W reproduction in the annual that I will email to Leif. He can forward it to you. They onIy printed the Gold medal award illustrations in full color for the first year. I never knew how many Fuller Fabric ads he did, but you are probably right about 4 total. After a closer look, the Fuller Fabric ad is not a cafe scene, but probably a private patio in the same Potter style as the others. Actually, there's a larger repro in B/W for an ad in the back of the annual, so I will scan that one. Your recollections of Potter are very interesting Daniel, and his comment "Create art because you love it!" is so appropriate for all art students.. and perhaps all artists. Is this the Fuller Fabrics piece you're referring too? Daniel, yes that's the one. I must have missed it, when it was posted. Those posted are the only Fuller Fabric ads that I know of. I understand that he may have influenced Bob Peak considerably at the time. Do you have any insight on that? I could also see Potter influence in Phil Hays' 60s' illustrations. It was always a guess as to who influenced who, in those days. Although, for the most part, it was friendly competition, there was a lot of insecurity and perhaps even back room deals with agents, illustrators and clients.. at least those were the rumors. Did you have the impression that Potter took pride in being a top illustrator early on, and did he get out of the illustration business to teach and (or) pursue fine arts? My memory is a bit foggy but Potter did talk, briefly, about Bob Peak. They went to school together. Apparently Jack went to NY and hit first. 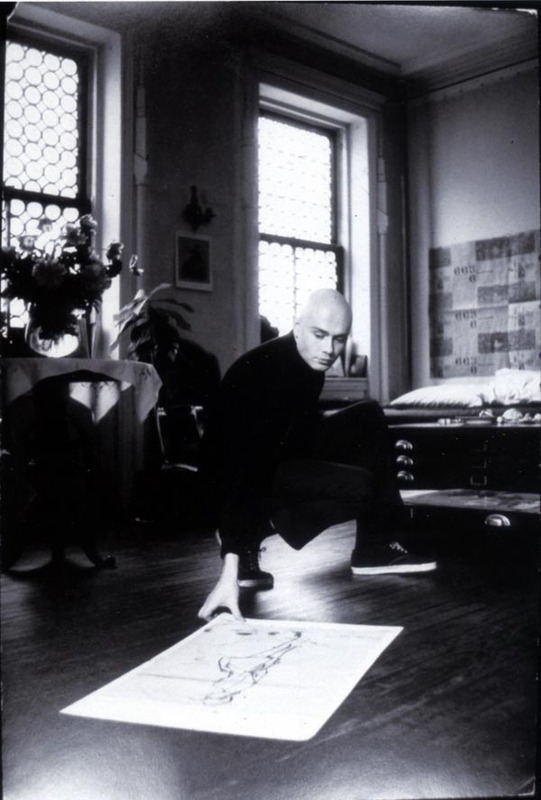 It wasn't until after Bob came to visit Jack in NY that his art started to take off too. As for Phil Hays I believe he was a student of Jack's which I'm guessing is where the influence comes in. You have to remember Jack started teaching not long after he graduated from Art Center. Guys like Phil Hays were around the same age as Potter. I bet most people thought Jack was older than he really was due to his bald head (remember this wasn't a popular thing back then). I know Jack took pride in being a well known illustrator. Not only did he work hard but there were other artists in the business whose work he liked. Carl Erickson being his favorite. He collected tear sheets of his work. Not only the stuff in the American Vogue but anything he did. What wore on him was the pressure of the business. He said that many clients simply wanted him to repeat himself which is something he didn't want to do. In tomorrow's installment I talk a bit more about Jack leaving the business. the level of similarity between these illustrations and the painting of french Nabis is clearly visible for me, the composition, the color, the line. Brilliant! The colors just out at you as well as the position and stances of some of the people. I would love to know what medium he used. For some reason I'm thinking of gouache. And I have no idea why. I was doing some on-line research when the name Jack Potter presented itself. I studied with Maestro Potter at SVA in 1960-61 and his teaching was truly inspirational. To this day I will look at a subject/scene and visualize it as Jack taught me to see. I am writing this note looking at a drawing Icompleted in one of his classes of a woman in a white victorian dress standing at an upright piano. One class that stands out in my memory was of Jack getting very frustrated with the class getting much too involved in details. He walked around the studio, threw every pad to the floor and ordered the class to paint directly on the drawing boards. What a memorable lesson that was. Truly one of the finest teachers ever. This is a question: In 1969, around the time I was graduating from Chouinard Art Institute, I saw a few Jack Potter illustrations and showed them to my teacher, telling him, "This guy is doing a Bob Peak style!" He corrected me by telling me that Jack Potter and Bob Peak were friends and had been doing similar stuff at Art Center before going to NYC. He told me that upon graduation they were planning to go to New York together, but Potter convinced Peak's family that Peak was suffering a nervous breakdown, so they did an intervention and committed Peak to a sanitarium for rest. But it was a prank. By the time Peak talked his way out, Potter was already established in New York, and Peak looked like the imitator. Weird story, My teacher swore it was true. What do you think? I know those guys (Bernie Fuchs, Fred Otnes, Bob Heindel)were all practical jokers, what about Jack Potter? I studied with Mr. Potter at SVA in the early 80’s. To this day I think of him when I draw. He was a force of nature. I recall him telling my lines were chicken scratch. Great teacher.